I am a Bangkok driver. I no longer flinch when I see a motorcycle come barging at me when he is supposed to be in the opposing lane. I'm far bigger than he is. It's his job to get out of my way. I no longer miss my turn just because I cannot find my way into the proper lane. It's all a game of chicken, and my losing days are behind me. 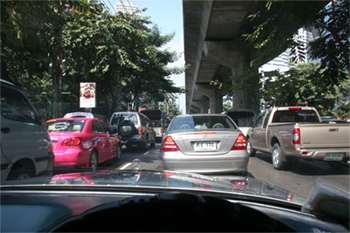 I am once again a Bangkok driver; the rules of the game have all come back to me. Turn signal is a sign of weakness. One must not show signs of weakness. Determining the right of way is simply a matter of will. Whoever wants it more gets it. And I want it more. Even traffic lights have different meanings. Yellow light is a sign to hurry up, not to slow down. Red light is merely a suggestion. And, perhaps most important of all, there is no breaking traffic law. Not until you get caught. But then again, there's always the phone number of your uncle the police general in your mobile. The only problem about all this is, I am now back in California. I guess I'd better be taking the bus for a while. Heh.